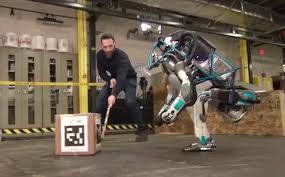 Hopes of AI machines taking our jobs received another kick in its titanium groin yesterday when Boston Dynamics’ disastrous program to build a shelf-stacking robot ended in failure. (see video below). Top US scientists have now decided the only workers that robots can realistically replace are US politicians. This entry was posted on 23 August, 2017 in homepage and tagged Ethan Harrison. Bookmark the permalink.